The 2018 Toyota Prius is a popular compact hybrid that's built for the tech-savvy driver. It has a wealth of gadgets inside that are designed to keep you entertained and informed on your ride. 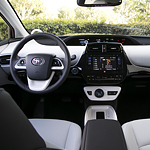 The most noticeable piece of technology in the cabin is the large infotainment center. Toyota offers a few different configurations of the Entune system. On higher trim levels you can get an 11.6-inch screen. Regardless of the screen size, the system provides you with access to your favorite music and displays navigational information. Also available is a head-up display that's projected right onto the windshield. You can set it to show your speed, hybrid system information, or turn-by-turn directions. Learn more about the 2018 Toyota Prius Hybrid by visiting us at Capitol Toyota. We'll give you a tour around our showroom in Salem and set you up behind the wheel of the Prius for a test drive.